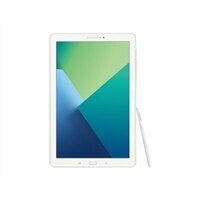 Samsung Galaxy Tab A with S Pen - tablet - Android 6.0 (Marshmallow) - 16 GB - 10.1-inchImprove office and mobile productivity with the powerful Galaxy Tab A. View, create, and edit documents, spreadsheets, and presentations with the preloaded Microsoft Office for Android apps, and access them from anywhere with Microsoft OneDrive cloud storage. Take notes and annotate documents and presentations with the precision Samsung S Pen . Samsung Knox defense-grade security keeps corporate information confidential and secure. Improve office and mobile productivity with the powerful Galaxy Tab A. View, create, and edit documents, spreadsheets, and presentations with the preloaded Microsoft Office for Android apps, and access them from anywhere with Microsoft OneDrive cloud storage. Take notes and annotate documents and presentations with the precision Samsung S Pen . Samsung Knox defense-grade security keeps corporate information confidential and secure.